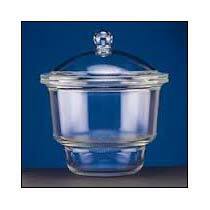 We deal in Glass Desiccators that are mainly used for storing moisture-sensitive items. Our Glass Desiccators are available in various sizes, and we can also make available customized desiccators. Our Sealable Desiccators are easy to maintain and can be used for storing different kinds of chemicals. They can be purchased at market-leading prices from us. We are a prominent name as Glass Desiccators Manufacturer, Exporter and Supplier from Pondicherry, India. The contents of desiccators are exposed to atmospheric moisture whenever the desiccators are opened. It also requires some time to achieve a low humidity. Hence, they are not appropriate for storing chemicals that react quickly or violently with atmospheric moisture such as the alkali metals; a glovebox or Schlenk-type apparatus may be more suitable for these purposes. Desiccators are sometimes used to remove traces of water from an almost-dry sample. The lower compartment of the desiccator contains lumps of silica, freshly calcined quicklime or (not as effective) anhydrous calcium chloride to absorb water. The substance is put in the upper compartment. The ground-glass rim of the desiccator lid must be greased with a thin layer of petroleum jelly or other lubricant to ensure an airtight seal.